Langalibalele (his name means the sun is boiling hot) was chief of the amaHlubi, numbering some 9400, who settled peacefully in the upper reaches of the Bushman’s River, in the Drakensberg mountains near Giant’s Castle. Many of the tribe worked in Griqualand West on the diamond fields, and were given firearms in lieu of cash payments. The colonial government required these firearms to be registered; the amaHlubi refused, and were declared to be in open rebellion. Colonial forces were mobilised to prevent Langalibalele and his people fleeing over the Bushman’s Pass into Lesotho. 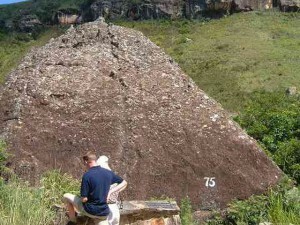 Difficulties in navigating the mountain terrain and the ill-defined passes led to the military under Major Antony Durnford arriving at the head of the Bushman’s Pass after many of the amaHlubi and their cattle had already reached the top. General confusion and unease within the pursuers led to indiscriminate shooting by both sides, in which five of the colonial troops were killed, forcing the government forces to retreat. After subsequent pursuits by a considerably larger force of colonial and regular troops, Langalibalele surrendered on 11 December 1873. He was sentenced to life imprisonment on Robben Island, but British Government intervention saw him released in 1875. For more information about each site see The Rebellion of Langalibelele 1873.